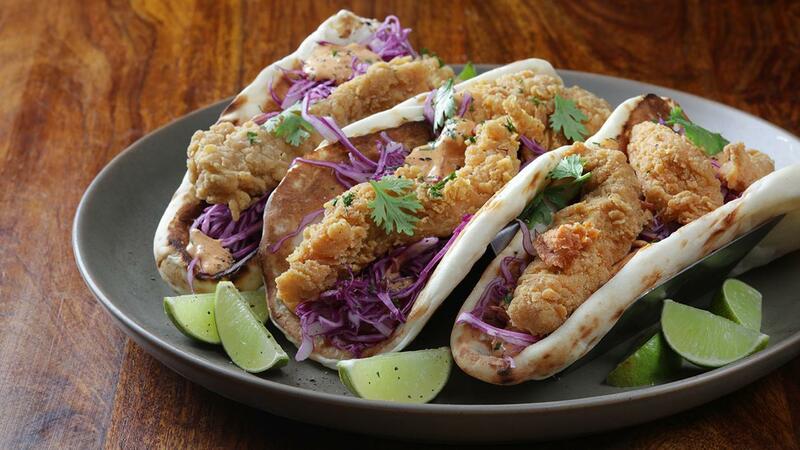 This recipe has some comfort food favourites, super crispy chicken strips on a bed of purple cabbage, wrapped in soft Naan bread. The dressing is a spicy curry sauce and a squeeze of lime juice to finish. View full recipe below. Sauté onions, garlic, ginger & chilli until soft. Add curry powder, Knorr Chicken Powder and cook to release flavours. Add tomato paste and cream. Blend until smooth. Reduce until sauce is thick, remove and cool down completely. Mix sauce with Hellman’s real Mayonnaise. Mix all dry ingredients together, except the water. Coat marinated chicken in The coating mix and then dip into cold water for 10 seconds. Coat the chicken again in the dry flour mix. Deep fry in preheated oil of 170°C. Warn the naan bread, spread curry mayo sauce. Place chicken and garnish with onion, coriander and mint fresh, drizzle more sauce on the chicken and sprinkle some Knorr Lime Seasoning Powder.